With landscape varying from the wonderful, snowy High Atlas mountains to the sand dunes of the Sahara, vibrant Morocco is one of Africa’s largest energy consumers, yet it remains remarkably underexplored, particularly along its long Atlantic Margin. San Leon Energy are shooting seismic in the underexplored Zag Bas Draa Basin in south-east Morocco. Source: Novoseis Although hydrocarbons were first investigated in Morocco over a hundred years ago, the country is still surprisingly underexplored, especially when compared to its North African neighbors like Algeria and Libya. The Atlantic Margin offshore, in particular, is undeveloped, with only 34 wells along the whole Moroccan Atlantic coast. Recently, however, companies have begun to look at this area, spurred by interest in Atlantic conjugate margins. Meanwhile, several recent successes suggest that the onshore area could also be revisited. The number of exploratory wells drilled in most of the fourteen sedimentary basins in Morocco is extremely low, with many not reaching their objectives or spudded off structure, and the number of exploration models tested so far is limited. As one of the continent’s largest energy consumers, Morocco is now the second largest importer of energy in Africa, importing 91% of its gas and a massive 99% of its oil requirements. Total annual production is about 2 Bcfg and comes from only two onshore basins, Rharb, north of Rabat (0.8 Bcfg) and Essaouira, south-west of Marrakech (1.8 Bcfg). With a rapidly growing economy, Morocco is under pressure to find new reserves at home. Basins and license areas of Morocco. The southern Tarfaya Lagwira Basin lies in the disputed territory of Western Sahara, which seeks independence from Morocco. Morocco is intriguingly situated at the triple junction where the African continent, the expanding Atlantic Ocean and the Alpine Collision Zone all meet, resulting in a highly complex and fascinating geology, with rocks spanning all geological ages. It is dominated in the south by the Precambrian-Paleozoic Anti-Atlas mountain ranges, which were deformed and faulted during the Upper Devonian-Carboniferous Hercynian orogeny. An event which had a significant effect on the petroleum geology of Morocco was the prolonged extensional period, resulting in the opening of the Atlantic. This commenced with Triassic-Lower Jurassic rifting, followed by massive regional subsidence in the Atlantic passive margin during the Jurassic and Lower Cretaceous. The extension was responsible for the deposition of up to 7 km of clastics, evaporites and carbonates in Mesozoic troughs, which were inverted to form the Mid and High Atlas Mountains in the Middle to Late Tertiary as Africa and Europe collided, an event which also resulted in the formation of the Rif Mountains in the north of Morocco. Equally important was the widespread deposition of syn-rift salt in the Triassic, sometimes over a kilometre thick, in both onshore and offshore basins. These evaporites are found on both sides of the Central Atlantic rift, but in Morocco their overall depositional and stratigraphic setting are relatively poorly understood and their occurrence is complex and unpredictable, especially when compared to the ‘post-rift’ salt deposits further south in Angola and Gabon. Source rocks of varying ages have been identified in Morocco. 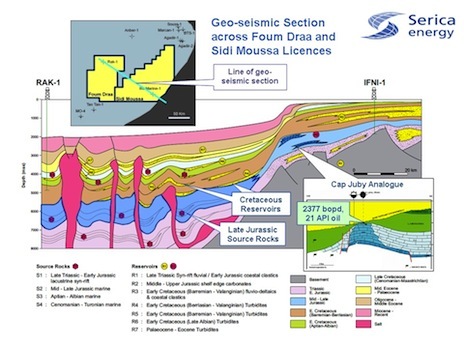 As with much of North Africa, Silurian shales, which can exhibit TOC values as high as 12%, are an important source and are probably responsible for the highly mature gas in the eastern Essaouira Basin. Other Paleozoic organic facies are widespread throughout Morocco and oil sampled from both on and offshore wells have been found to be generated from Paleozoic source rocks. Potential Mesozoic sources include Triassic lacustrine syn-rift infilling graben in the Atlantic coastal basins, while the Rif, Mid and High Atlas basins contain rich Lower Jurassic source rocks, up to 10% TOC and usually within the oil window. These are probably the source for the many seeps in these areas and may be quite widespread, possibly sourcing the light oil in the offshore Cap Juby structure in the Tarfaya Basin, while the heavy oils in the same structure are biodegraded Late Jurassic hydrocarbons. Marine Cretaceous rocks containing up to 20% organic matter are found throughout Morocco and if the overburden is sufficient, as in the offshore Atlantic Basins, these should provide a very effective source rock. Similarly, Neogene marls and shales, which are known to produce biogenic gas, can also produce oil if buried deeply enough. Paleozoic Carboniferous deltaic to turbiditic reservoirs are found in the north-east and also possibly in the southern Tindouf Basin. Devonian carbonate reefs also form reservoirs, while Cambro- Ordovician sandstone and conglomerate reservoir intervals are found in central Morocco. The majority of reservoirs, however, are Mesozoic. There are widespread Triassic fluvio-deltaic sediments, and many Jurassic reservoirs, varying from reef carbonates in northern basins to sandy dolomite and carbonate in the Essaouira Basin. Cretaceous sands with porosity as high as 30% are found in the central Tadla Basin and in the south. Tertiary reservoir intervals include sands in the Rif, the Rharb Basin and sands and conglomerates in and underlying the melange of the Prérif nappe. Oil seeps have been known in Morocco for centuries. In 1923 the first discovery, Ain Hamra, was made near seeps in the Rharb Basin in the north-west, coming on stream in the 1930s. A few seismic surveys were undertaken in the 30s, before WWII stopped exploration. In the 1950s seismic was first shot in the Souss, Guercif and Essaouira basins, resulting in small gas discoveries, and oil was found in the Prerif area. By 1958 cumulative production was still low, but a new Hydrocarbon Law successfully attracted foreign interest, and by the 1970s over forty companies held exploration licenses and 176 wells had been drilled, covering most basins. Fifteen commercial oil and gas accumulations fields were found, including Morocco’s largest oilfield, Sidi Rhalem (1961) in the Essaouira Basin, and the only offshore discovery, Ras Juby (1969), which remains undeveloped. However, by 1981 many of the new entrants had moved elsewhere. In 1980 Morocco’s largest wet gas field, Meskala, with 52.5 Bcfg recoverable reserves, was discovered. To develop this and to encourage further exploration, the government set up ONAREP to explore for hydrocarbons both alone and with foreign companies. Between 1981 and 1990, 85 wells were drilled, and several discoveries were made, but by 1990 all exploration licenses had been relinquished. With a new hydrocarbon law in 1992 interest again increased, and between 1990 and 2000 fifteen onshore wells had led to the discovery of three gas fields. Only one well was drilled offshore, and that proved dry. More attractive fiscal terms were introduced in 2000, and in 2003 ONHYM merged previous state entities ONAREP and BRPM. A new dynamic was implemented and a total of 40 onshore and six offshore wells have been drilled since 2000, leading to 11 gas discoveries. By the end of 2011 nearly 30 companies, mostly independents, had interests in Moroccan acreage, but large areas of acreage remain open both on and offshore. Schematic cross section through Serica Energy’s blocks off southern Morocco, illustrating the variety of prospective offshore plays. Source: Image property of and provided by Serica Energy plc. Offshore, deep water gravity deposits such as turbidites provide the main reservoirs, may include carbonate reefs and deltaic topsets further up-dip. Lack of offshore exploration means that a detailed knowledge of offshore basins is poor. The main seal for the subsalt is provided by thick Triassic shale and evaporite layers, while Tertiary, Cretaceous and Jurassic marls and shales and in places salt seals the younger reservoirs. The primary trapping mech an ism is expected to be halokinesis, providing a variety of traps below and above the salt, particularly in the offshore. Other trapping mechanisms include tilted fault blocks, flower structures, extensional rollovers, compressional folding and stratigraphic pinch-out. 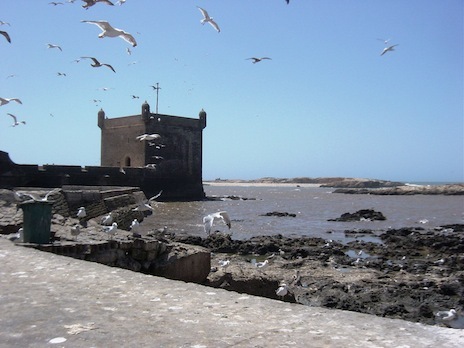 The ancient port of Essaouira looks out over the rough and windy seas of Morocco’s Atlantic coast. It has attracted visitors for millennia, from the Phoenicians in the 7th century BC, to Orson Welles, who shot his 1952 Othello here. It is now interesting explorationists, who believe billions of barrels of oil may lie offshore. Source: Jane Whaley Much of Morocco remains hardly touched by the drill bit, particularly the offshore Atlantic Margin, where only a few wells have been drilled in an area that extends along 3,000 km of coast and is up to 150km wide. The majority of these wells date from before 2003 and tested Jurassic carbonate objectives in shallow water areas. Many had shows, proving working petroleum systems, but Cap Juby was the only discovery. Further indications of the potential of the offshore Moroccan Atlantic margin come through comparisons with its conjugate margin in Nova Scotia. Corresponding although less well explored plays seismic sections show a convincing symmetry in structure and stratigraphy. In the Scotian Margin off Canada over 200 wells have resulted in 23 fields and proven resources of 6 Tcfg and 200 MMbo, suggesting that Atlantic Morocco, with only 34 wells, could hold significant undiscovered reserves. A number of almost untouched offshore play concepts have been identified, including Tertiary and Upper Cretaceous sediments trapped by salt walls, charged by Cenomanian-Turonian source rocks. This play was unsuccessfully tested by three deepwater wells in 2004. A 2009 well about 70 km southwest of Tangier also tested the Tertiary and found a 90m gas column. Lower Cretaceous deepwater sandstone turbidites, charged by Lower Cretaceous and Jurassic shale intervals, were unsuccessfully tested in 2008. Along the Jurassic shelf edge and the present upper slope domain, Lower and Middle Jurassic further deepwater sandstone turbidites, sourced by Jurassic or older shale intervals and trapped in structural fault rotated blocks and stratigraphic reef build-ups, are expected. Similar turbidite reservoirs sourced by Cretaceous and Jurassic shales form the main sub-salt plays, with hydrocarbons trapped in salt-induced structures. There is also potential for discoveries in Triassic red beds and fractured Paleozoic sandstones and carbonates. Serica Energy has identified 33 prospects and leads and over 2.9 Bboe unrisked reserve potential (Serica’s best technical estimate) in its two large blocks off Agadir, in a range of halokinetic, stratigraphic and structural plays. About 100km to the north, off Essaouira, Kosmos has a multi-well program targeting Cretaceous and sub-salt prospects on channel reservoirs. Further offshore PuraVida Energy have identified several leads, including a 790 MMbo (mean) prospect it believes to be a lookalike to Jubilee in Ghana. Kosmos have also identified a very large, unexplored Cretaceous river delta system with potentially billions of barrels further south off the Western Sahara area, while Maghreb Petroleum is looking offshore Casablanca, with objectives in pre-nappe Paleozoic, Mesozoic and Tertiary rocks and in post-nappe Miocene sands. And these are just a few examples of the potential many companies believe could lie offshore Morocco. East of Tangier and into the Mediterranean lies the Alboran Basin. The geology here, the result of the collision of Africa and Europe, is complex, but there are potential turbiditic reservoirs, Tertiary organic-rich shales and a variety of possible stratigraphic and structural traps. With only two exploration wells and very little seismic, this area is seriously underexplored. 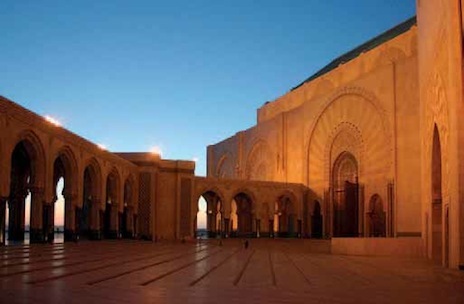 Evening shadows and the last rays of sunset playing against the courtyard of La Grande Mosquée Hassan II in Casablanca, a seaside mosque of spectacular size and grandeur. 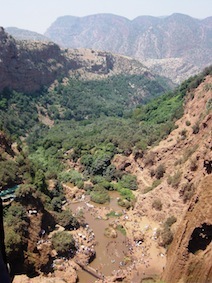 Source: Bruce Winslade Looking over the edge of the Cascade d’Ouzoud in the High Atlas mountains to the valley 110m below. Faulted Jurassic rocks are overlain by Quaternary lacustrine limestones. Source: Jane Whaley Onshore, there remains considerable hydrocarbon potential throughout Morocco, in almost untouched areas as well as heavily explored ones. The Rharb Basin, for example, the setting for the first commercial discoveries, is still attracting interest, being one of only two actively productive basins at the moment. Circle Oil has made ten commercial gas discoveries from 11 wells drilled in the northern part of the basin since 2008. As the basin lies close to large population centres, the small, shallow fields found to date have proved profitable. With over 3,000m of Upper Miocene clastic sediments above the nappe complex and a thick series of infranappe Eocene and Oligocene turbidites, there remains considerable potential, particularly in the practically unexplored deeper parts of the basin, where there may be sufficient depth of burial for oil generation. Similarly, the Rif mountains folded belt in northern Morocco was a hydrocarbon-producing province until the 1950s, mostly from Tertiary turbidites or thrust-related plays with Jurassic reservoirs. Exploration in the area is now concentrating on the deeper reservoirs and also moving to the almost completely unexplored area near the city of Fez, where Cabre Maroc has identified a number of large prospects. At the opposite end of the country is the large, almost unexplored, Zag Bas Draa Basin, the westernmost extension of the prolific Paleozoic basins which extend right across North Africa. The basin extends over 96,000 km2 and has almost no seismic coverage and only 27 wells, all drilled between 1959 and 1964. With over 6 km of Paleozoic, including thick Silurian shales, this basin could well hold untapped potential. San Leon Energy, for example, considers that its large Zag permit in this basin has estimated resources over 500 MMboe. 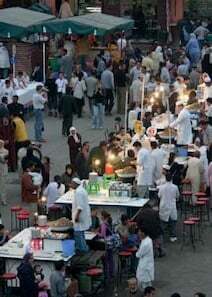 Part of the famous Djemaa el Fnaa square in Marrakech – the vibrant beating heart of Morocco. Source: Bruce Winslade Ever-increasing energy de mands and a decreasing number of large discoveries turned the attention of Moroccan geoscientists to uncon ventional resources. A first assessment of possible unconventional gas reser voirs, based on rock descriptions and geochemical data such as vitrinite reflectance, TOC and Rock-Eval analyses, showed that the subsurface contains a significant number of interesting shale layers, particularly in the Paleozoic. The main shale gas reservoirs are the Silurian sequence, with black ‘hot’ shale at the base, characterized by a high TOC content ranging from 1 to 12%. Oil shale is also under development – in fact an oil shale pilot plant produced from the Upper Cretaceous Tangier oil shales in Northern Morocco between 1939 and 1945. San Leon Energy is involved in the Tarfaya oil shale project in the south, and has drilled a number of appraisal wells, estimating that there are in place reserves of about 22 Bbo in an Upper Cretaceous eroded anticline. This resource is also found at Timahdit in the Mid Atlas, where the Upper Cretaceous oil shales are up to 250m thick and estimated reserves are 15 Bbo in place. Morocco is considered to be one of the most politically stable countries in Africa, virtually untouched by the recent troubles in neighboring countries, with a democratically elected government. The fiscal terms for hydrocarbon exploration are considered to be very favorable, with long duration permits, total exemption from income tax for ten years after first production and the state paying its share of participation. With a growing population and economy – GDP grew by 4.6% in 2011 – as well as a major phosphate industry, which needs natural gas for processing, Morocco is looking to international companies to help fill its energy gap. It would appear that there are plenty of resources out there, both on and offshore, just waiting for companies to explore and exploit. Acknowledgement: Many thanks to Haddou Jabour of ONHYM and Dimitri Massaras of DrillingInfo International for assistance with this article. A thirty year independence struggle with Ethiopia means that the natural resources of Eritrea remain largely untapped, but there is ample evidence that this now peaceful country is highly prospective for oil and gas.